Wait a second, so now Jennifer Aniston and Reese Witherspoon are attached to a new TV series/limited series about morning TV news shows? Sounds familiar! And they're pitching it to HBO? Huh. And Steve Kloves (Fabulous Baker Boys, etc.) is producing? Wtf. We can't have it all. We are being spoiled at the moment and I was never that crazy about the proposed TV show she was attached to. I would like to see her working with Steve Kloves again. Took the words right outta my mouth exactly!! One of her best performances. So much fun and I love the scene with her in The Inn, shooting green flames, slitting throats and taking names. So, so great. Didn't know it was the anniversary!! How great!! Have always had a soft spot in my heart for the book n of course the film!! Paramount really screwed up the marketing of the film and giving it an August release date didn't help. It's such a lovely, good film. I see so many people on social media who love it and they only saw it on a plane or DVD or Netflix, not in the theater because they didn't think it looked good, or it was more for kids. It kind of has a cult following now to a small degree. And now Vanity Fair with a lovely piece about Stardust and it's 10 anniversary. I never saw this appearance, thanks for posting it! She was always so relaxed with Leno, the complete opposite with Letterman, Lol. 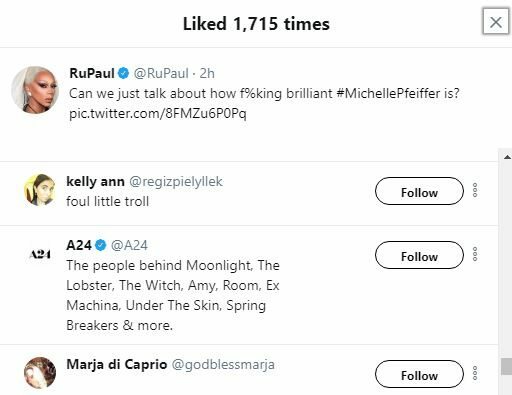 RuPaul just tweeted about Pfeiffer this morning, which is amazing, but even more amazing is...A24 liked the tweet. A24 once again showing they love Pfeiffer. Why can't they buy Where is Kyra? Or get a great project going for her? Not a bad way to get ready to say goodbye to summer!! I still have not seen Sinbad. I love her work in People Like Us. If only the rest of the movie was as good as she is. Stay safe down there! Hope you and all of south TX come through the hurricane OK. Stay safe and enjoy your Michelle marathon. The Pfeiffer Love Fest of 2017 continues. Joan Collins introduced a screening of Fabulous Baker Boys at an event in the UK tonight, it's her favorite film and she has said nice things about Pfeiffer before, especially her performance in this film. guys how did we miss this! Cate Blanchett calling our Michelle brilliant at the end of this vid!